These never-ending gas price hikes can really grate on you after sometime. I still fondly remember those days when I was paying $1.60 a gallon, around 5 years ago. Those were the days when I remember actually grinning while filling up my tank. Nowadays, it’s another story, so we’re doing what we can to make a dent on our spending on gas. Right now, my family is saving $5,500 a year on gasoline and commute-related expenses based on changes we’ve made recently to our travel habits. We dropped the long, crazy, daily commute. Most of you already know that I resigned from the job that required me to drive to the city of San Francisco, which was 30 miles away from my faraway, secluded home. I drove daily and logged at least 60 miles a day based on my commuting schedule. The long commute did more than add stress to my life and do a number on my health; it also cost at least $26 a day to deal with. $10 a day on gas as evidenced on this page from fueleconomy.gov, a great resource that tells you how fuel efficient your vehicle is. It turns out that the cost of gasoline hasn’t yet been updated on the above page to reflect today’s much higher prices, but you can extrapolate current costs accordingly. 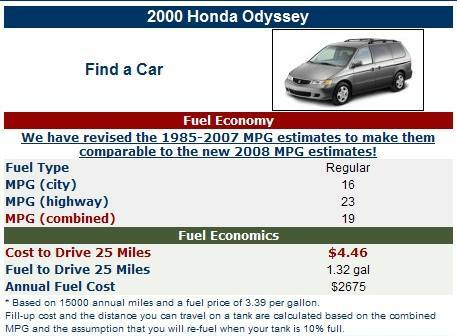 At 1.32 gallons for 25 miles, the cost to drive our minivan for 25 miles was around $4.50 when gas was at $3.39 a gallon. At the current $4.5 a gallon that we have here in California, it’s now worth $6 to drive 25 miles! You don’t necessarily have to quit your job to achieve the same results. Using mass transit or car pooling methods may help. Or how about requesting your boss for more telecommuting hours? I realize that not all companies are agreeable to policy changes like these, but companies may want to evaluate the feasibility of such a change if they realize that more and more valuable employees who live away in bedroom communities may benefit greatly from such adjustments. Unfortunately though, some of these solutions may not at all be practical for everyone: for instance, I was unable to car pool or use mass transit due to the logistical issues I faced when dropping kids to and from school while juggling the 9 to 5. So it really is a matter of trying to be creative with solutions that can possibly work out for you. We don’t drive around much — not yet at least. Since we work either at home or very close to home (minding our own businesses 😉 ), and our friends and family don’t live too far away, it’s helped us control our driving and travel expenses. It also helps that we’re having family and friends over for visits instead! New car in the horizon? We’ll be considering fuel efficiency. We’re not yet at the point of trading in our cars for those gas-saving alternatives. But right after we drive our cars to the ground, we’ll certainly be prioritizing on fuel efficiency and shopping with our eye on improved gas mileage. Admittedly, we were not as keen about gas usage in the past, but no longer, given the way things are trending with gas and oil prices. We’re keeping up with historical gas prices, with real-time updates! Fear is a motivator, especially for me. I’m able to control some of my actions by scaring myself about the impending consequences of those actions. My spouse, however, calls me out often and says that I “catastrophize”. Maybe so, but it’s a good thing when it keeps me disciplined. Along these lines, I found a visual motivator that may help remind us how gas prices have been treating us these past few years. This is an interesting tool from Gas Buddy that I thought would help us keep our mind on conservation. You can track historical gas prices across time and place using various locales and various dates using the fields above. But there’s a small bug with the display when you change the values which causes the chart to become wider than it should be (sorry for that). Our Total Savings On Fuel and Other Commute-Related Costs: $5,500 At Least! Late last year, with gas at $3.30 a gallon, I used to spend approximately $40 on fuel every 3 or 4 days when I’d use up 3+ gallons a day on driving. These days, it’s more like $50 a week. After some calculations, I’ve determined that we’re using half as many gallons a day on our van as we used to. So by tossing the job in favor of a home business, my savings run $30 a week on gas and $80 a week by eliminating unsavory parking expenses, for a total of $110 a week! So how are you dealing with these gas price increases? Any ideas you’d like to share? Should We Pay Extra Fees For Carry On Baggage? You can use a site like Gas Buddy to find the nearest gas station with low prices. It’s pretty accurate for our area. Had a similar post on my blog last month where I presented mileage and gas price data I had collected for 2.5 years. I’m spending about $600 a year to travel 10 miles per day; a bike will soon greatly reduce that cost (with the added benefit of exercise). The post is already out of date, in the past month my cost per mile has gone up about 30 cents. I’m not sure which highway you take, but I’m guessing it’s 101 north or 280 north. You forgot to mention how driving could literally kill you and how much that costs. My tires were slashed recently by debris and that cost me a bit. I have a picture of it here: my sad car. Just today some crazy jackknifed big rig ran into 8 cars in Menlo Park and spilled a bunch of diesel. I lived one exit north of Menlo Park so when I got on the highway today noone was on it since all the northbound lanes were closed in Menlo. Oh right, and a few months ago a freaking oil tanker spilled over a ton of gasoline. I wrote about that here: crazy CA highways. I only drive 9 miles each way, and I think it’s too much. I really wish San mateo had better public transit. Anyway, enough of my griping. I’m jealous that you don’t have to drive so much anymore. Gas Buddy is a great tool to find out the lowest priced gas stations. Also, workers underestimate how much they can save just by finding a job closer to where they live. You’ll save time, energy and hassle, which all equate to some amount of money. You’ll also literally save on car and gas bills by shortening your commute. Thanks for sharing your post with us. Being used to long commutes, I find 10 miles a day not bad at all! But it sure still adds up. Cool, if you’re opting for a bike! I’m not brave enough to attempt biking anywhere just yet… 🙂 I’ve been sticking to the stationary kind! I used to take 280 N, as you’ll see in the youtube video I highlight here, showing a bit of my commute 😉 . So true that there’s also added risk to your health, life and limb, the farther your commute happens to be, just in terms of accident risk and such. So as John mentions, these things should be taken into consideration when you are weighing job prospects and you’re contemplating a higher paying job that may be located much farther than other jobs in the vicinity of your residence! I’m seriously considering getting a bike and making the 22 mile round trip commute to my work each day. Right now I ride the bus which takes about as long (1 hour) and cost $64 a month. A friend of mine fills up the tank of his car (which is about the car I would use to commute) for $75 every two weeks. Add to that insurance at $600-$700 a year or more and abandoning car transportation can save you money, but lose you time. There are trades-off here I guess. When I “retired,” I cut a 20 mile commute, five days a week (that’s 400 miles a week!) out and that’s been saving big bucks. I went from filling up once a week to filling up once every three weeks and it’s been great. It is kind of scary seeing the gas prices change so drastically in three weeks though. WOW $4.50 a gallon and I thought $3.89 was bad here in SC! I only have a 10 mile drive to work and fill up my 98 Neon every 9 to 11 days but it still hurts. Thanks for the gas buddy link. I think our country still really needs to find sustainable resources to use for fuel. I am not sure exactly what, but it definitely needs to be done. Moved to a car/bike/train combo and am saving over $100 a month in gas costs (after subtracting the $60 I’m spending on a commuter pass). I’m still driving about 80 miles a week. Once school starts up again, I’ll be down to about 20 miles a week, or less if I add a bicycle trailer for getting the kids to and from school. I would have moved sooner, as I enjoy taking public transportation and am a conservationist when I can be; gas prices provide a handy excuse to commute, however. Inflating your tires to the max firewall pressure and not exceeding the speed limit will help significantly. This post has been chosen to be in the 69th Carnival of Money Stories at Almost Frugal, going live July 22nd, 2008. Don’t forget to link back to the Carnival! My best move was asking if I could telecommute, and then moving to a town with a much lower cost of living. My bills are about 1/3 of what they used to be, and I earn the same as before. There are a lot of things you can do to increase gas mileage, but the best thing is to buy an economical, fuel-effecient car! What was your drive to work before in mileage? My wife will be cutting her commute once we move and I can’t wait for the hopeful gas savings! Well, my drive to work was around 30 miles one way so that meant around 60 miles of driving per day (at least). I always felt somewhat crazy that I’d keep a job for 4 years that made me drive all those miles. But it still wasn’t as bad as the situation of my other colleagues, who used to commute 1.5 hours one way and included driving, taking the train then walking some number of blocks to get to the office. It can truly wear you out, and the commute costs do add up. Some people I know have decided to take apartments in the city so that they limit their commutes. The sacrifice of course, is that they cut down their time with their families since they only see them half the time (when they go home for the weekends, for example). Anything for a living, I guess. It’s tough to be without a job and it’s just as tough to have one.